After the breakfest departure from Marrakech around 8:00 morning , crossig the High Atlas mountains via the Tizi n’Tichka pass towards Ait Benhaddou village, the fortified ksar with it’s beautiful Kasbahs, Ait Benhaddou has served as a natural decoration for many movies producers since 1960’s. Once you get to Ait Benhaddou village you take a walk to go on the top of the hill to dominate the whole village. Afterwards, you will head to Ouarzazate for lunch next to the famous Kasbah of Taourirt which presents the historical and cultural interest of Ouarzazate, You will continue through the lunar landscapes and the Pre-Sahara routes until you get to Zagora which is a small town, the native region of Saadian dynasty (Saadian tombs in Marrakech) who used to rule Morocco in the XVII century. 18 km further more you will arrive to Tamgroute, a small village where most of locals are pottery handicrafts, Tamgroute is also well know by it’s old Coranic school and library collecting the old books. 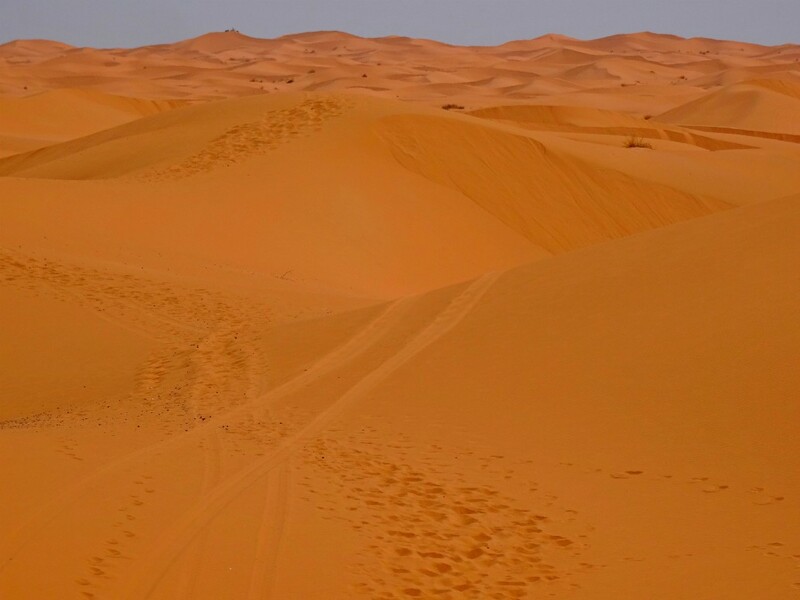 The next five kilometres will let you see the first sand dunes of Zagora called Tinfou dunes and give you a taste of Sahara desert dunes, ride the camels at the sunset and get to a camp located in a Oasis ,overnight in nomad tents. After seeing the sunrise we go back on camels ,after the breakfast and take shower , then start our journey backing to Marrakech …we arrive a ouarzazate in afternoon, after visiting ,we well contunie to Marrakech.